Knowing what minerals are associated with placer and lode gold (vein or reef) deposits is necessary knowledge for small-scale gold miners and prospectors whatever their individual levels of experience. In this series of posts I'll be listing and describing some of these gold-related minerals, especially those that are most directly associated with placer or lode gold. 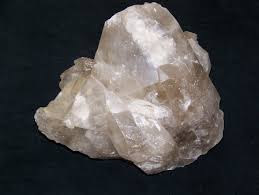 Quartz: I actually hate using quartz or quartzitic rocks as examples since quite a few folks tend to get fixated on quartz as the only "true path" to placer or lode gold. 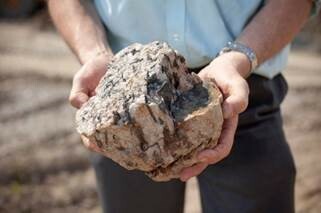 Quartz minerals are important to gold...there's no doubt about that. But as I said before in Bedrock Dreams, quartz is NOT the only mineral indicator of the potential presence of gold. You newbies and less experienced folks need to get that through your heads lest you get a bad case of tunnel vision in this regard. In the majority of cases, quartz rocks or rocks containing quartz don't constitute the presence of gold of and by themselves unless they show the presence of some sort of alteration including the presence of sulfides, pyrites, tellurides, and so on. Since I don't want to repeat myself in the lode gold section, quartz is often associated with gold-bearing vein material where the local geology is conducive to mineralization. To sum things up, yes...the presence of small bits of quartz or quartizitic rocks in your gold pan can be positive mineral indicators, but they are never a sure thing when it comes to getting placer gold. 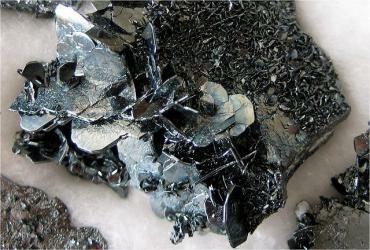 Hematite: One of the main constituents of what miners call "heavy black sands." Hematite is one of the main iron ores and tends to be silvery black, greyish-black, or even reddish orange if oxidized. Since hematite is magnetic, it can be drawn out of a gold pan with a magnet when dry. 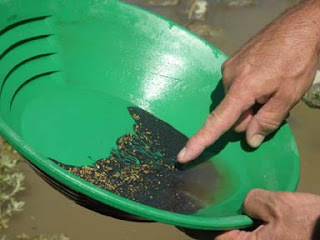 Heavy black sands and placer gold (if present) will be the only things remaining in your gold pan, sluice box, or dry washer during a clean out along with any other items of fairly high specific gravity like lead. Here's the deal though. 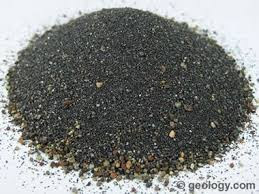 Heavy black sands can be found all around the world, even in areas or locations containing no gold whatsoever. So hematite's value as a gold indicator can only be trusted in areas or locations where historical gold recovery occurred or where the probability of gold mineralization is significant. Magnetite: This is hematite's twin brother (or sister...take your pick). It's description is very similar to hematite's, if not nearly identical. Magnetite, as the name implies, is magnetic since it's main structure is composed of iron. Again, both hematite and magnetite are mineral indicators for the presence of gold in known gold areas or locations indicating gold mineralization. Often, microscopic particles of gold can be found in concentrates containing heavy black sands which is why some savvy small-scale guys and gals re-process their black sands through fine-gold recovery systems. 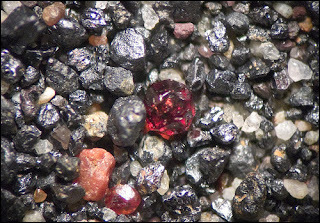 Garnet: My birth stone! 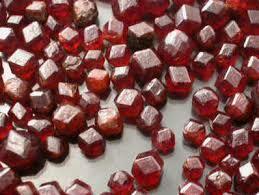 Garnet is a semi-precious stone often used in jewelry. 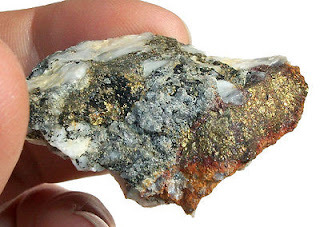 It frequently turns up in gold pans or sluice boxes in certain gold areas, but not all. Garnets usually have a translucent appearance and are red, reddish-pink, ruby colored, or even reddish-orange at times. 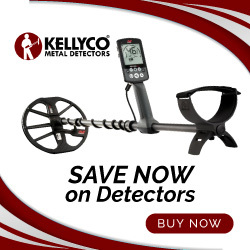 You'll know what they are because they'll hang back in your pan or box along with the heavy black sands and placer gold...if you recovered any that is. Corundum: A rock mineral indicator that's nearly always associated with igneous, metamorphic, and sedimentary rocks or geology. Key in on the terms "igneous" and "metamorphic" because those are big gold-producing geologies, especially metamorphic. If you're finding bits and pieces of corundum in your pan or box there's a good chance placer gold is around too. 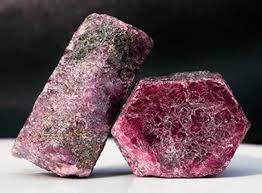 Essentially corundum is an aluminum oxide that usually takes on a pale pinkish cast or deep red wine color most of the time. On rarer occasions corundum can be a dirty brown or brownish-yellow color. It's sometimes used as a gemstone. That should keep you occupied for now. There's more to come, so stay tuned.